A special ceremony to mark a major milestone during the creation of an innovative new building for growing businesses has taken place. A number of VIP guests were invited to celebrate the ‘Topping Out’ ceremony at Harborough District Council’s Grow on Space project – due to open at the end of 2019. ‘Topping Out’ is traditionally held during building projects when the last beam, or its equivalent, is placed at the top a structure during its construction. 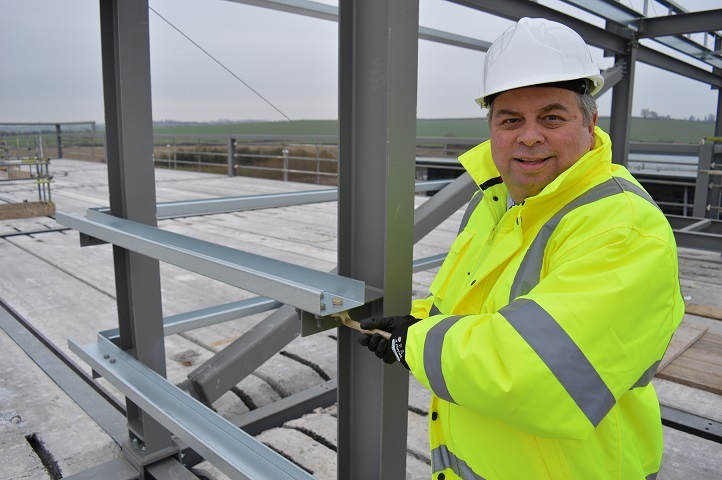 Leader of Harborough District Council Neil Bannister was invited to tighten a special gold-coloured bolt in the final part of the upper structure of the building, alongside others involved in the project. The Grow on Space project, set to create around 230 jobs and bring £20million into the local economy in the Harborough district, will see the development of an innovative new commercial building that would provide office space for businesses looking to grow and move into larger accommodation in the district. The building, being constructed at the Compass Point Business Park in Market Harborough, is being funded by Harborough District Council which is providing up to £3,620,612 the European Regional Development Fund (ERDF) which is providing £3,282,500 and the Leicester and Leicestershire Enterprise Partnership (LLEP) which is providing £987,833. The building will provide 19,000 square feet of office space, supporting 10 to 15 companies when at full capacity. Office suites, ranging from 1,000-3,000 square feet, will be available. The Grow on Space follows the success of the Harborough Innovation Centre, which Harborough District Council developed and opened in 2011, to provide office space for start-up and new businesses.